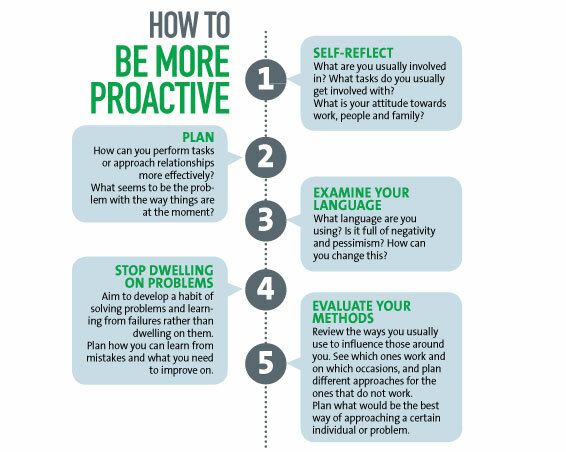 Being proactive is clearly easier said than done. Although now and again we would strive to be proactive, there is always a stumbling block. So, here are a number of obstacles that hinder people from being proactive. We are often reactive rather than proactive. We respond to the situation as it happens instead of planning ahead of it. We usually don’t take the initiative to tackle things with this kind of perspective. People with this reactive mind set tend to blame their circumstances. “They find external sources to blame for their behaviour,” says Stephen Covey. Though it is a normal reaction, we still have the power to choose how we respond to any situation. According to Andrew J. Blum, we remain in a reactive pattern guided by unconscious beliefs and assumptions when we are unaware of our own mind set. Therefore, even an unaware mind set can prevent us from being proactive. “You can set yourself up to be sick, or you can choose to stay well,” says Wayne Dyer. We can choose to wait till we fall sick or we can be proactive and keep ourselves healthy. The way we behave in a situation would show if we are being proactive or not. Our mind set reflects how we behave. If we have a reactive mind set, we would automatically behave in a reactive manner. We are fixed on saying, “there’s nothing I can do” or “I can’t, that’s me.” This attitude will stop us from being proactive. According to Camille Preston, “the prefrontal cortex can only focus with intensity for 90 minutes.” That is why our attention can easily be distracted. Distractions are divided into two parts, internal and external. One example of an internal distraction would be our thoughts whereas technology is an external distraction which, at times, we cannot control. In this era, we are more distracted than ever from electronic devices to social media. We constantly need to check our notifications from WhatsApp, Facebook or Twitter. No doubt technology helps us to stay connected but aren’t we all so absorbed in it that we become reactive? We respond to the situation late because we are distracted by unnecessary things at that moment. Our thoughts can also pull us away from completing a task at hand. We could have gone through an emotional circumstance, thus, we are unable to focus. There is no room for proactivity in our mind at that time.